Here in Alabama we’ve had a very humid and hot Summer to the point where some days were just too hot to even go outside to sit. So, the cooler mornings have been such a wonderful blessing, and believe you me, I have taken advantage of them. Okay, back to my post. 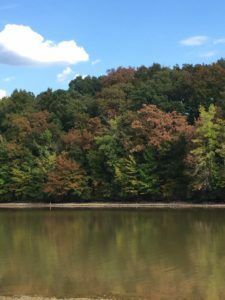 One of the thing I look forward to the most in the Fall, is every year my husband and I take a road trip through Little River Canyon & Desoto State Park to enjoy the beautiful scenery of the mountains. To see the beauty of the God’s handiwork is just breathtaking. We usually pack a lunch or grab a bag of burgers and have a picnic at the park in Desoto. Afterward our lunch, we will go for a walk down the trails or we may even hike down into the canyon. Sometimes, we even make a friend along the way. Now that Fall is here it’s one step closer to Christmas. Yes, I said Christmas. 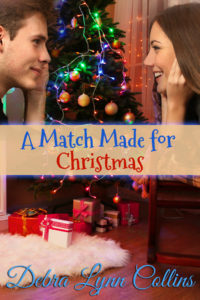 :-) In a few weeks all of us will be gearing up for the Holidays, so that’s why I decided to share a little with you about my Christmas novella, A Match Made for Christmas. You can’t give anyone a man for Christmas, or can you? All of a sudden, Seirra Marshall finds herself anonymously receiving several roses along with various date invitations from men she barely knows. She wonders what is going on. When she discovers the truth, she is heartbroken and questions if the man she trusted is in on the whole matchmaking scheme. Corbin Whitley is in love with Seirra Marshall and has been since the day he first laid eyes on her. When he discovers she is single again, he decides to do whatever it takes to win her heart. Just when he thinks that is happening, something goes terribly wrong. Will he be able to fix the wrong done to her, or is it too late? Here’s a question for you. 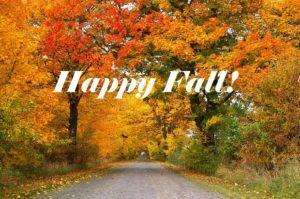 What is your favorite season of the year and why? Like Alabama, we’ve been roasting here in Charlotte, Debra. In fact, the humidity this year has been worse than years past. I’m really looking forward to those cool and crisp mornings. I’m also looking forward to reading your latest release…what a cute cover! Thank you, Jill! The humidity has been the worse in years here, too. But, it’s been in the lows 60’s for the last few mornings, and I’m loving it! :-) Such a wonderful relief from the morning 80’s that we’ve had for the last few weeks. I, too, am ready for fall! We haven’t hit the cooler mornings yet here in VA (well, it’s in the high 70s, so I guess that’s some cooler. But it’s not *cool*.) but I’m anxiously awaiting them. Hey, Elizabeth! We are still having hot, hot days, but for the last few mornings they’ve been nice and cool. I’m praying that cooler days are on their way to you. Here in Kentucky we are still in the high 80’s and as an ex-pat Brit I am melting. Cooler weather is forecast for next week. As to my favorite season, it’s Spring. I love all the newness of it. The buds, the blossom. All the baby animals. God has a way of showing you what to expect for the year to come. Happy Days. Hey, Lorraine! I’ve always lived in the south, but this Summer’s had me melting, too. This has been the worse we’ve had in years. The Fall has always been my favorite season, but I’m really, really looking forward to it this year. Thankfully, we’ve been having cooler mornings, but I’m ready for the cooler days, too. Living in the Midwest, we are ready for fall, my favorite season. We had a hot humid summer and spent most of it indoors. We enjoy fall with road trips too see spectacular foliage, Apple orchards, vineyards and pumpkin patches. Hopefully cooler weather – during the day it is still in the upper 70s. Hello, Renate! I would love to go on a rode trip with you :-) For the last few mornings the temperatures here has been in the low 60’s, but the day time temperatures are still hanging out in the 90’s. Thankfully, change is on it’s way!! I like Fall almost as much as Spring and Summer (basically all except winter). I love the changing of leaves but really enjoy blooming flowers season and summer at the beach. 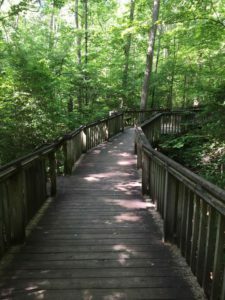 I also really enjoy hiking and loved your pic. It reminds me so much of state parks in upstate NY where we used to live. My husband and I used to grad sandwiches and find a nice spot near water to eat and recharge our batteries. I also think it’s like we’re in another world. we just did one of our hiking trips and I already miss it. Fall is my favorite season. I love the cool, crisp air, changing leaves, and pumpkin. Hey, Beth! I’m right there with you! I love everything about this time of year! I love spring! New birth – birds returning, flowers blooming, butterflies flitting are encouraging signs that winter’s leaving. Although I enjoy all the seasons and the change they bring. My favorite season is winter! Snow, Christmas, snow, building snowmen, snow. Did I mention I love snow? lol. Your Christmas novella sounds great! Fall is my favorite. I love the changing colors in nature, cooler temps, and the scent in the air this time of year. The only thing I don’t like is we lose a little more daylight everyday. Congratulations on your Christmas book. Hey, Kimberly! I do have to agree with you about less and less daylight. That is my least favorite thing about this time of year. For us, after the clocks roll back, it’s dark at 5:00. I would be happy if we didn’t have to change our clocks at all. I love fall! The temps are cooler, the apples are in season and the world comes alive with color. We take my Mother-in-law on an annual foliage drive to enjoy the change in season and I, of course, take pictures to document how beautiful the state of Maine can be. Hello, Julianne! We use to take my mother with us on our trips every year, too. This will be our fourth year without her, and this is the time that I miss her the most. I also have an album filled with pictures of our trips from the last several years. Wonderful memories! Debra, thanks for sharing your photos. Fall is pretty, I’m still not a fan of fall. I know I’m in the minority, but fall weather means winter is coming. I don’t like cold weather. I live in a place where summers are very, very hot. I like hot. Spring is my favorite. Hey, Merrillee! I’m just the opposite, I don’t like hot :-) If I had to make a list, I think my line-up would be Fall, Spring, Winter, and then Summer. Especially if it’s a Summer like this one. I would have to say Fall. I love the colors changing, the crisp air, and being able to start wearing layers and warm cuddly things. It seems the sunsets and sunrises are more vibrant during this season too. Your book sounds interesting and I hope to read it someday. Hey, Marylin! Oh yes, I agree with you about the sunsets and sunrises. They are absolutely gorgeous this time of year! I used to love spring most, because it meant we were a long way from winter. But the older I get, the less I can handle heat, so I’ve come to dread summer more than winter. Now that I’m writing full time from home and don’t HAVE to go anywhere every day, regardless of road conditions, winter is actually my favorite. I love the slower pace, the sparkling snow, and the crisp air. I’m Canadian, so I guess I SHOULD like winter, but it took a few years to come around to that! Hi, Valerie! I think if we had more snows I would like the Wintertime better, but we just don’t get very much of it here in the south. Most of our winters all we get is just flurries, and if we are lucky enough to get a dusting of snow on the ground, they start closing schools :-) Our winters are just cold and dreary. The funniest thing about it all, is when it does snow I absolutely love it!!!! Fall, then spring. The summer is over and now for the cool weather, leaves turning, hummingbirds are here, what could be better, oh yes, Football…. Go LSU tigers!!! I’m waiting for fall as well, though I’m only slightly more north that Debra. :) We’ve had a few crisp mornings, but it doesn’t last long. My favorite season is spring, I think, but I enjoy fall a great deal too. Whichever, I enjoy it when I can open my windows and let the breeze blow through the house. Hey, Ginger! So far, the last few mornings has really been nice, but it doesn’t take very long for the temperatures to rise and reach the high 80’s or low 90’s. That’s why I have to hit the deck early, early, early. :-) Oh yes, to opening the windows and let the breeze blow in. I love it when you don’t have to have the air conditioner or the heater on. Growing up in the Deep South, harvest is a big celebration time and cooler weather is a welcome respite. I’m looking forward to your next book. Hi, Linda! 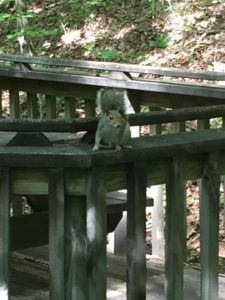 Another Fall fan!! I agree with everything you said, I couldn’t have said it any better myself. I love your Emoji’s, too. They are so cute! I loved this novella too, such a sweet story! Thank you, Autumn! I’m enjoying the cooler mornings, but I am so ready for the cooler days, too. I love your name by the way, it just might end up in one of my future books. A girl named Autumn in a Thanksgiving novella :-) What do you think? I used to say that Spring was my favorite, with its new life, release from the cold of winter. But since we moved to British Columbia, we actually get to enjoy Autumn with its glorious colors, crisp, sunny days and abundant harvests. So Spring and Fall have to share my top choice of seasons. Hello, Kathleenefriesen! Yes, mine are Fall and Spring, in that order. I’ve always loved the Fall, but this year I am so looking forward to it even more. I’m ready for these sweltering days to be over. Hey, Pattymh2000! This year, Fall is welcomed more than ever :-) I’m ready to pull out the sweaters, too. Fall is absolutely my favorite time of the year. I love when it gets a little cooler and my husband and I can take some more comfortable camping trips. Campfires, s’mores, and crisp cool air. Nothing like the smell of cooking bacon and brewing coffee when you’re outside. Hello to another Alabama gal and Roll Tide fan :-) I love it when it’s cool enough to roast hot dogs and marshmallows on an open fire, oh yes!!! I love fall because of apple cider & hot chocolate!!! Also, less humidity and no bugs!